Wind Storm was Windy's sixth foal and was the third foal sired by Windy's son, A HREF=http://www.mistysheaven.com/cyclone.html>Cyclone. 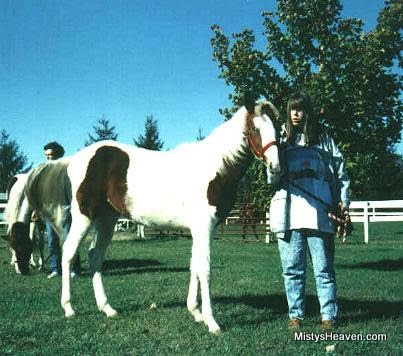 Windy was pregnant with Wind Storm when she was sold to Mike Pryor in 1987. The following year, Wind Storm was born. Mike held a contest to name the filly and Wind Storm was selected as the winning name because a strong wind had blown the night she was born. Wind Storm lived on the Pryor Pony Farm for many years, but sadly died at the age of fourteen due to health problems. It is unknown whether she had any foals.